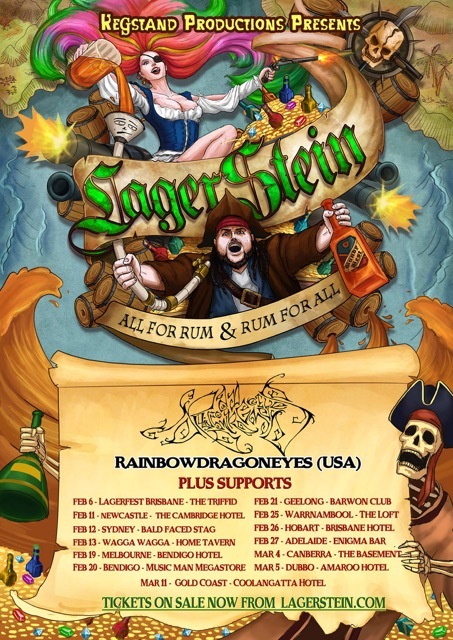 The seven-piece, all drinking, all rocking, all pirating rock/folk/metal powerhouse from Brisbane, Australia, known as Lagerstein, have come ashore to release their latest collection of eleven sea shanties in the shape of All For Rum & Rum For All. The release follows up their debut album, 2012’s Drink ’Til We Die and continues their journey as Australia’s one and only kings of pirate-metal. Upon release of All For Rum…, the band will take to the road (via the S.S. Plunderberg) for an extensive tour with Rainbowdragoneyes (USA) before heading out to sea once again. Rum filled cellars, beer wall to wall… yarrrharrrharrr. What a glorious day for the S.S. Plunderberg and my crew. It’s been 40 days since we found the greatest treasure. Worth more than the entirety of all the gold, silver, and bronze throughout the seven skies. This rum has no equal. This rum tastes superb. Now Lagerstein, with beer bongs in hands, we take to the skies. You may think you’ve tasted the finest of rums, the purest of ales. But never before has the world experienced a rumtastic party of this magnitude. By the time you finish reading this, we’ll have already set sail. On-deck of the S.S. Plunderberg is a crew of 15 hungry-for-fun party pirates, having completed the recording of their second album All For Rum & Rum For All. Our itinerary be simple; visiting every tavern, stopping at every port, partying with all the locals and drinking all sorts. Now, you bring your stein and hat. And we’ll bring the jungle juice, beer and rum. All who endeavor will forever join the Lagercrew on this never ending venture for fun. Keep your salty eye peeled, gallons of treasure awaits those who dig the deepest. All For Rum & Rum For All will be released on Tuesday 2nd February. Pre-orders are available now via iTunes.